Walking on the endless sand, waives touching the feet, crystal clear beaches untouched by crowd, crossing the many hills, relaxing on the seashore, crossing the Aghanashini river in ferry, camping at beautiful temple, enjoying the Kabaddi play on the beach, ended taking bath in beautiful Apsarakonda falls, highway side campfire whole night due to breakdown of vehicle, its all beautiful memories from two-day beach trek from Gokarna to Honnavara on 17 & 18th December 2016. 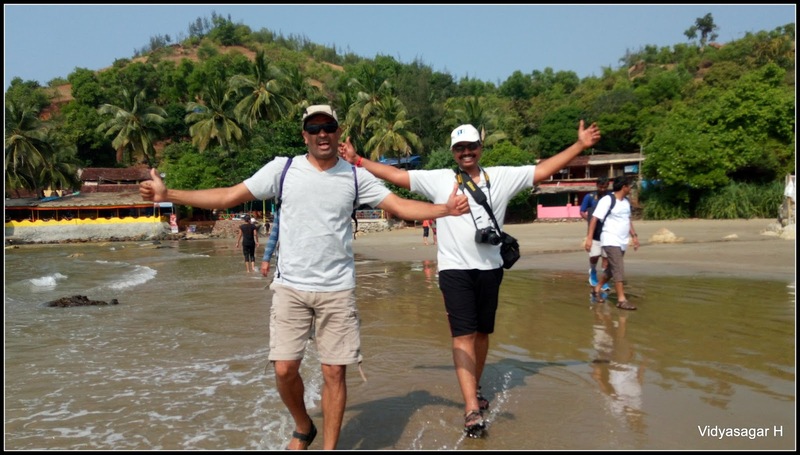 Beach trek was also one of the long time pending to do list in my bucket. 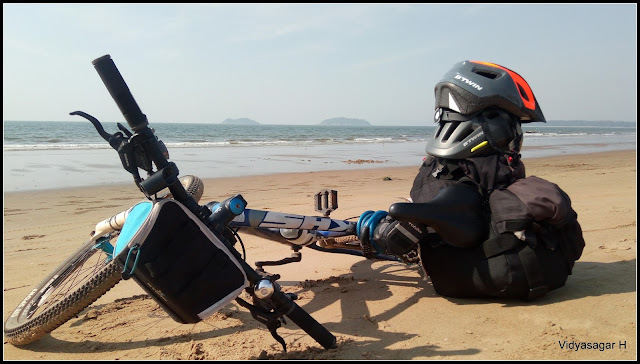 Finally, I and Shanthi Prasad taken a call to do this, we the friends in good number of 12 and hired Tempo Travel [TT]. We all gathered near Shanthi Prasad home, few of friends about to board different location on the way. The journey is around 500 KMs from Bengaluru to Gokarna. Prior instruction given to all of them to be ready on time to board the vehicle. Everything went well, we crossed the namma Bengaluru around 9.30 pm. The journey was good till 3 am, suddenly driver stopped the vehicle. After inquiry driver given reason “Fog is more, I can’t drive”. 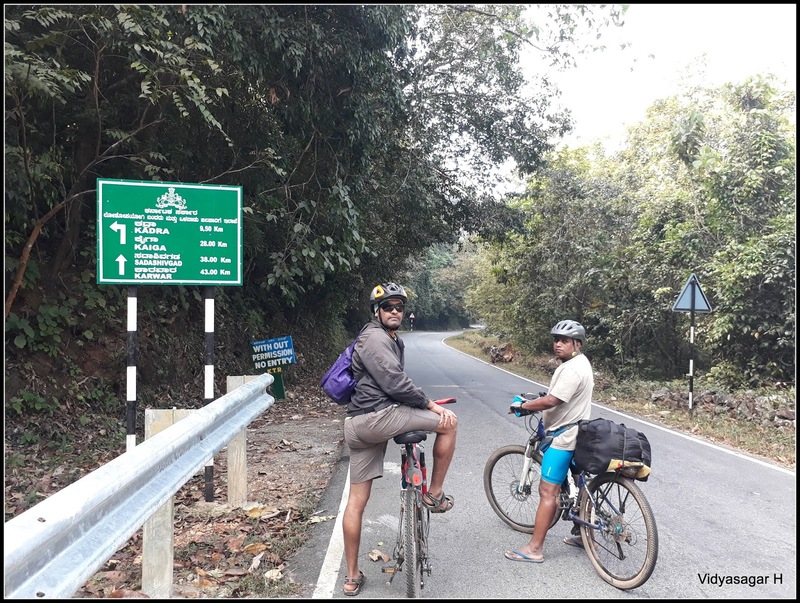 By the time we were close to Jog Falls, requested him to ride till Mavinagundi then take rest, however he refused. The time was almost 5.30 am, the sun is about to rise, we tried to wake up the driver. By great difficulties he continued the journey. We already lagging by 2 hours as per schedule, decided to fresh up at Mavinagundi and continue the journey. After small break, just passed the Jog falls ghat and Honnavara is around 10 KMs, one more shock of vehicle. The rear tyre got punctured, the replacement tyre was more worse than the damaged one. 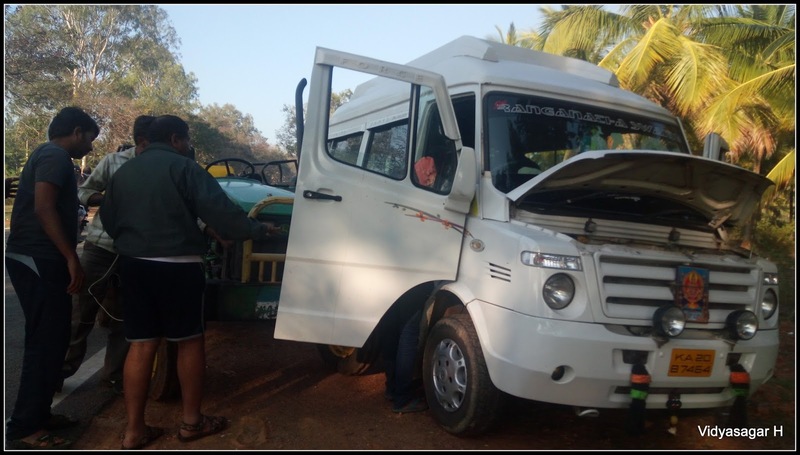 Some of friends helped the driver to replace the tyre, which again delayed half an hour. 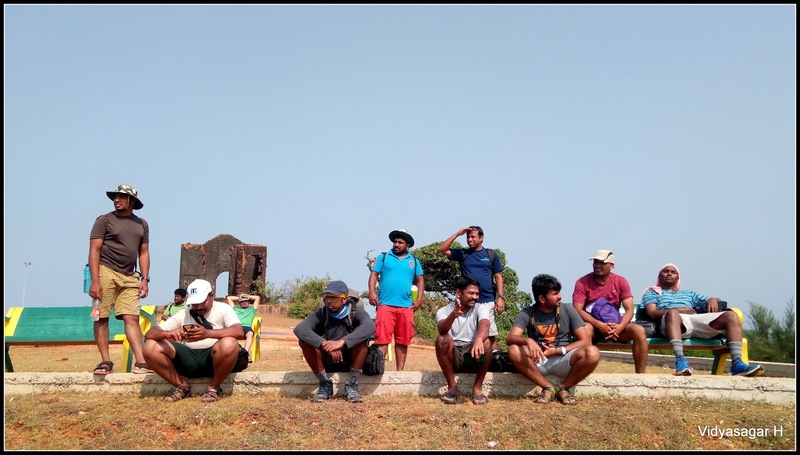 We all decided to have breakfast somewhere in Honnavara, unfortunately we could not able to trace out any good hotel, the journey was continued till Gokarna, reached at 10 am. Instructed all of them get ready quickly, since we were already late by 3 hours. Finished the breakfast and ready to start the trek. 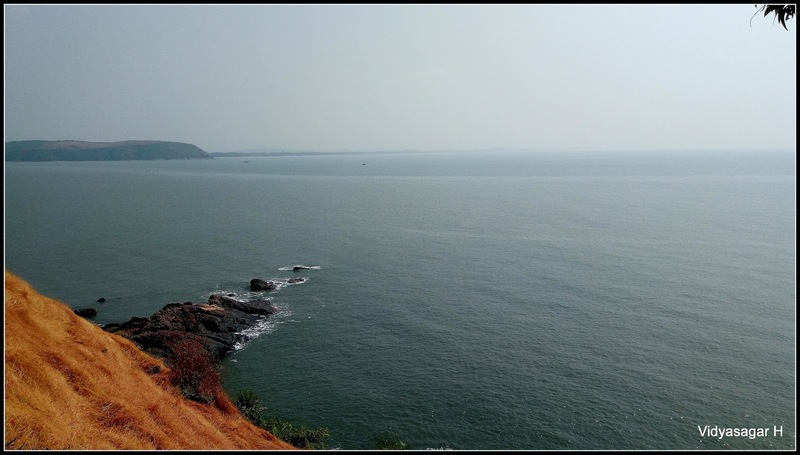 Shanthi Prasad & Sandeep K did this trail last year, they suggested to skip the starting point from Gokarna to Kudle beach. The reason was, we can catch up initial schedule which got delayed. 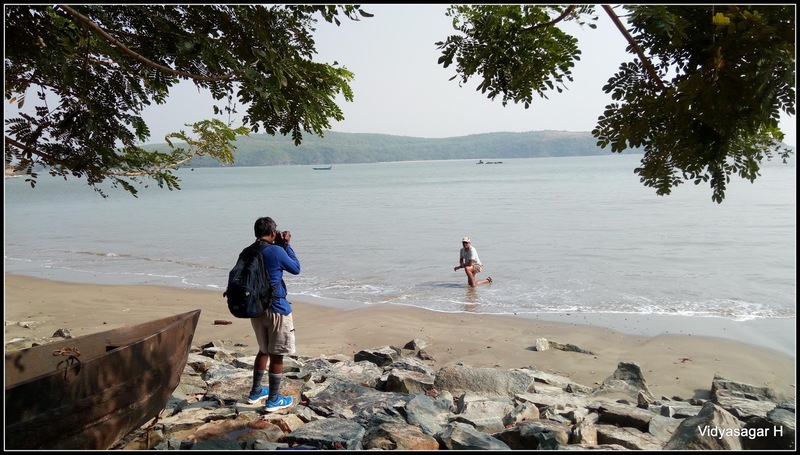 Thanks to both for valuable suggestions and headed in TT to Kudle beach. 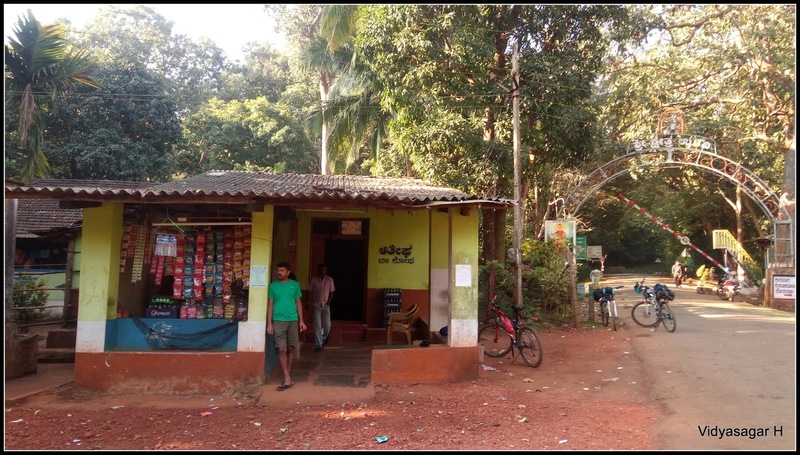 Relieved the TT guy and asked him to reach the night camping place of Holalagadde Sri Ramanjaneya Temple. The time was 11.15 am, we had very tough time to reach the camping site by evening before dark. Taken the group photograph and started the seashore beautiful journey. 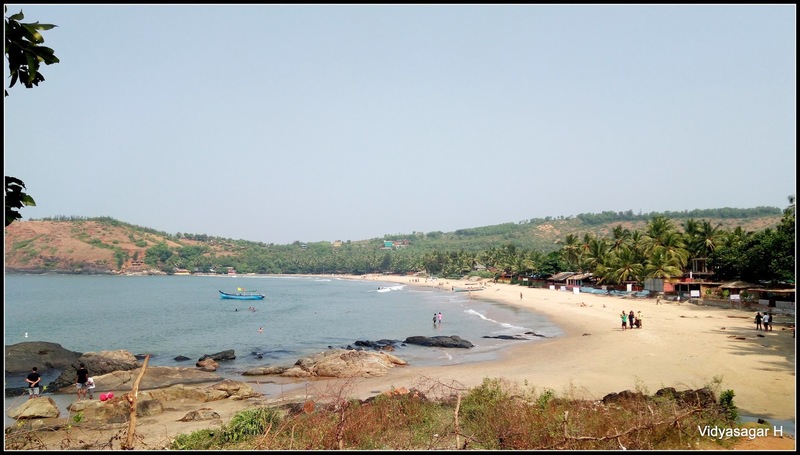 We could not able to make out which is the best beach, each has its own unique beauty. After many beaches we reached the place where we need to cross the Agnashini river in ferry boat. Crossing the Agnashini river in ferry was great experience, enjoyed the journey. Badly we were hungry, wanted to cover maximum trail then wanted to have the lunch. After crossing the river had the packed home made food. 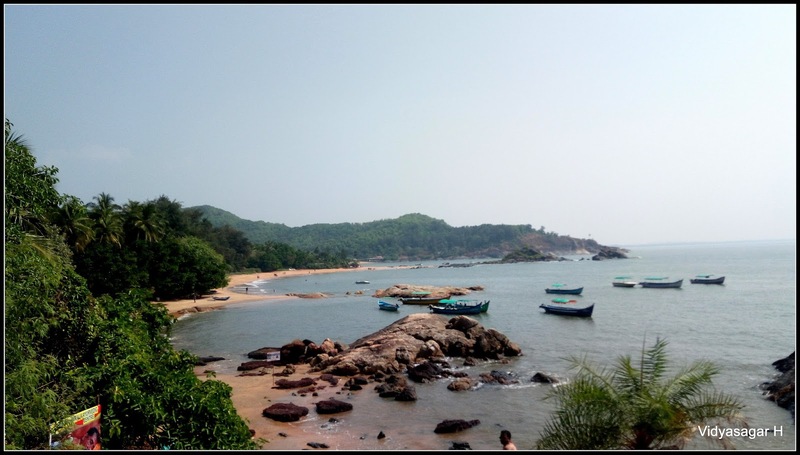 We have covered the below beaches till the camping site Holalagadde Sri Ramanjaneya Temple. 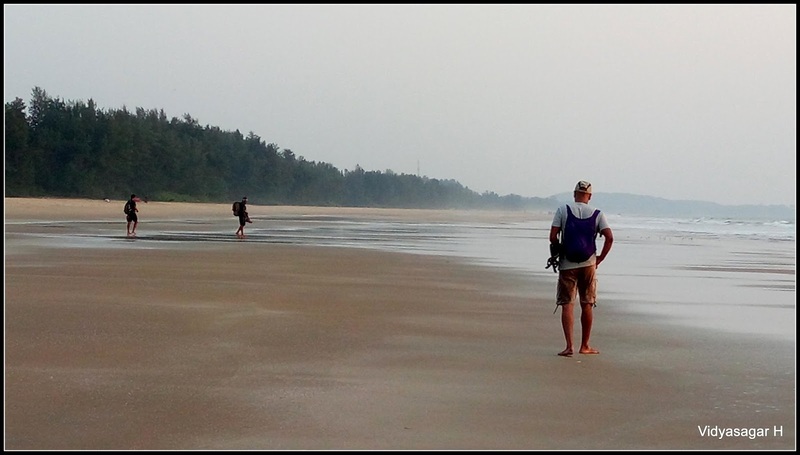 Walking on the beach gives lot of joy, beautiful panorama, cool breeze and untouched crystal beaches. Most of the beaches were not accessible by common tourist, thank god else they would become the garbage beaches. We reached the temple around 7.30 pm. Temple authorities are very cooperative and helps lot. They served the tasty Kashaya & mixture to all of us. Now the time is for dinner preparation, my dear friend Shanthi Prasad, Sudhakar & Vijay taken charge of preparation. Very soon yummy Bisibele baath is ready, by the time we all got refreshed with hot water. You can feel after the tiered day we all felt as a heaven of this temple. There are no words for their kind hospitality. We all had wonderful dinner and went a walk on the beach. This was a different experience all together on the lonely beach in the night. We all got up early in the morning and got refreshed. The team was busy in preparation Awalakki for breakfast. Considering the more left out night Bisibelebaath, decided to have the same in breakfast and Awalakki to parcel for Lunch. Again, it was tasty and filled our boxes for lunch. After the group photograph continued our journey towards Honnavara. 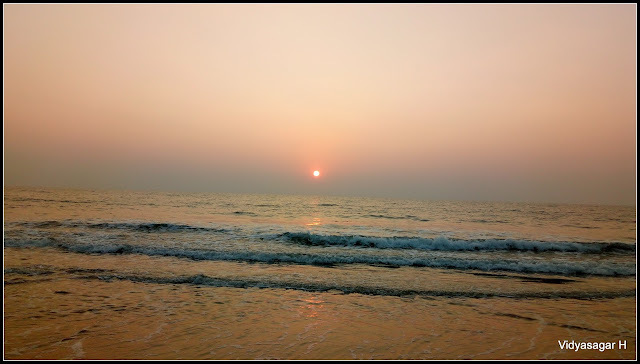 The morning and evening will be more pleasant to walk on the beach. Beach journey continued with fun filled. Second day was also covered many beautiful beaches. Crossing many beaches we come across one more backwater crossing through small boat. 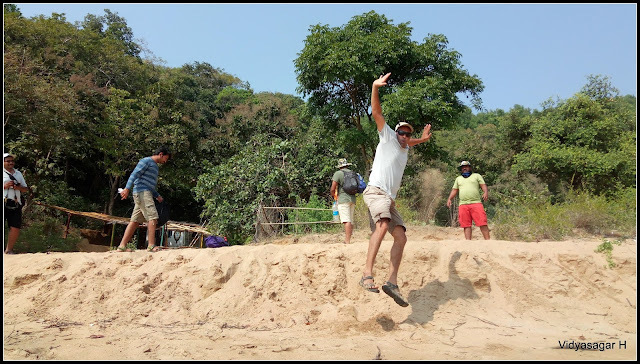 The journey is continued on sand beach with fun. We all had very relax journey of two days. 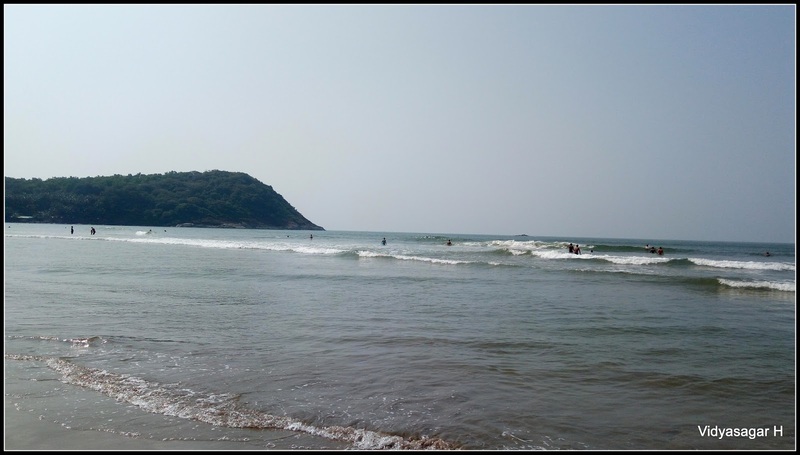 After long hot weather beach walk reached Dhareshwara Beach. 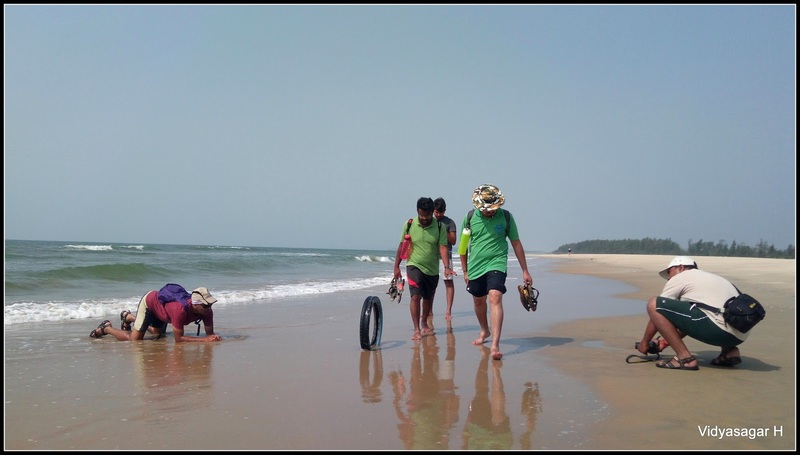 The actual ending point was Honnavara, considering the hot weather and time constrain, finished our trek at Dhareshwara beach. 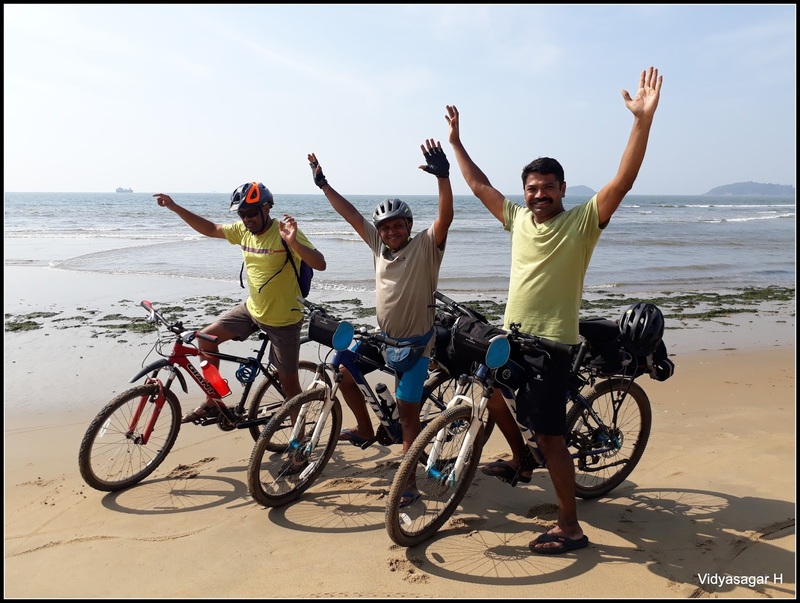 We finished our packed lunch near beach, the TT was also arrived to take us to Honnavara beach. Very soon we reached the sea shore. 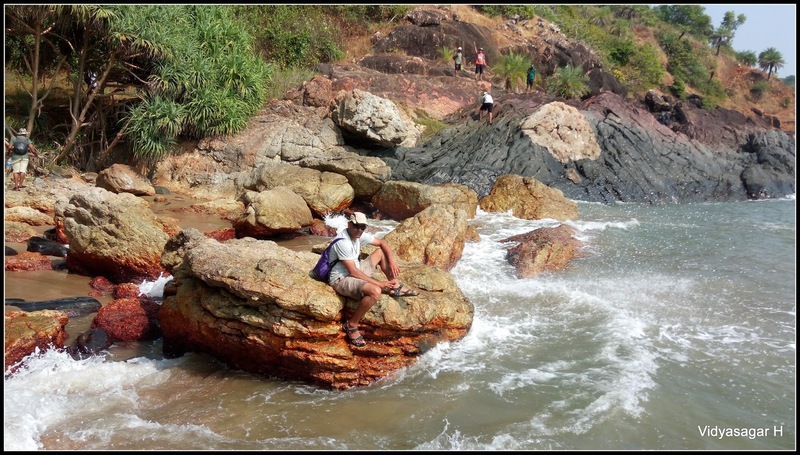 Two days we had been trekking on the shore, never dip into the sea. Everyone were eagerly waiting to enjoy the sea. 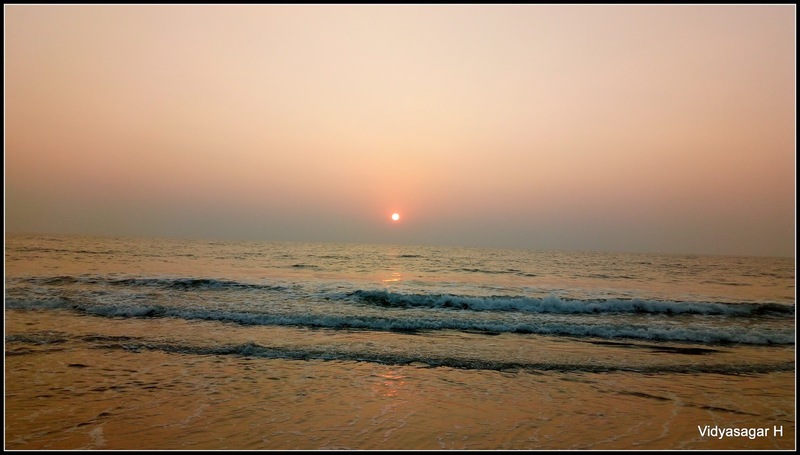 The real enjoyment begun, we all had fulfilled activities in the sea. There was no limit of excitement and fun, many of us become Aghori Baba of sand. The most memorable moment was playing KABADDI. The childhood golden days again refreshed to all of us. We spent good amount of time on beach and headed towards Apsarakonda Falls. 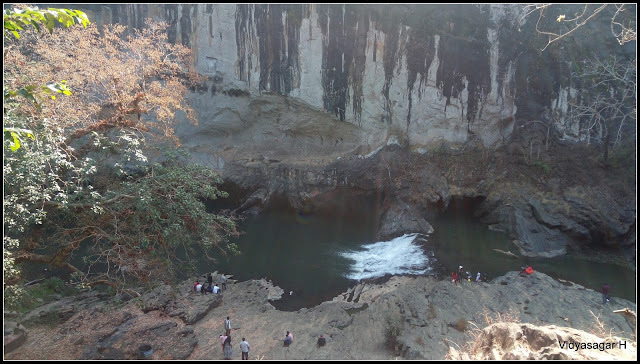 Apsarakonda falls is close to the beach, we should do small trekking through steps. It is ultimate place after the beach bath. We all got refreshed in falls and headed towards Bengaluru. The journey to Bengaluru is very far, not wasting time left the Honnavara. On the way, we had a lunch at Saagara. The journey was quite well till we cross Arasikere, suddenly we got a sound!! The rear tyre was flat. The time was around 3 am, we all had hope to reach early to Bengaluru. The driver careless did not get repaired the previous tyre. There was no additional good tyre for replacement. We never seen such ridiculous driver before in all our treks, holding the damaged tyre on the road side to take lift from someone. Luckily someone was stopped and he left to Tipatur which is just 10 KMs away from the breakdown place. 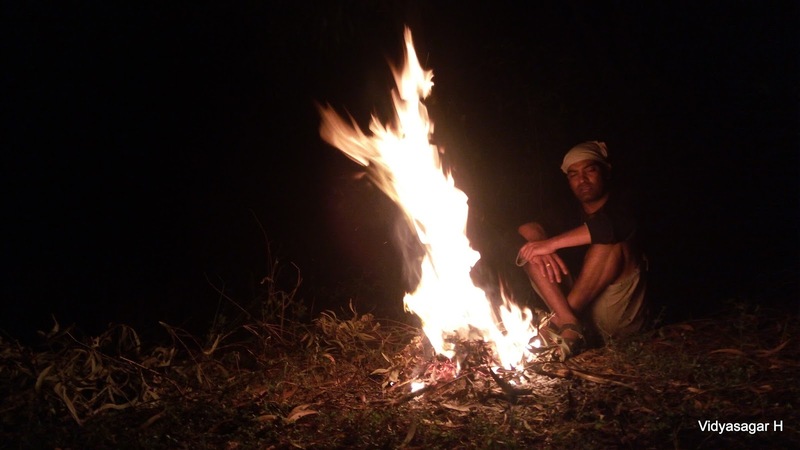 Sudhakar engaged to arrange the fire camp, one by one we joined with him. The time was around 5 am, driver keep on telling lie to reach within 15 minutes, that never turned soon. There was one more negligence by driver, he kept on the parking & headlight on. Vijay called him asked about to switch off the lights. Very casually answered “nothing to worry”. At last he back at 6 am with replacement of some old tyre. The twist was, battery completely drained and unable to start. We all pushed around 1KM even though it was completely off mode. We all must thank Vijay for aggressive and technicality to arrange the villager Tractor with additional battery to get mode on for this TT. The time was already 8.30 am, we all forgot about reaching office on time. Frustration level was crossed, highly negligence of the stupid driver. Reached Bengaluru at 12 Noon, we all had two days good time however the journey experience was worst. 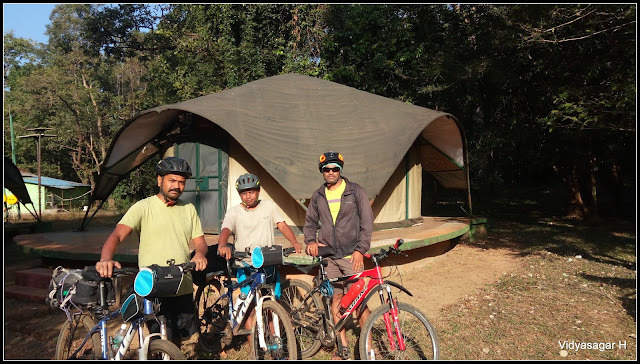 The fun filled event omitted the vehicle breakdown bad experience and all promised to meet again some other trek. 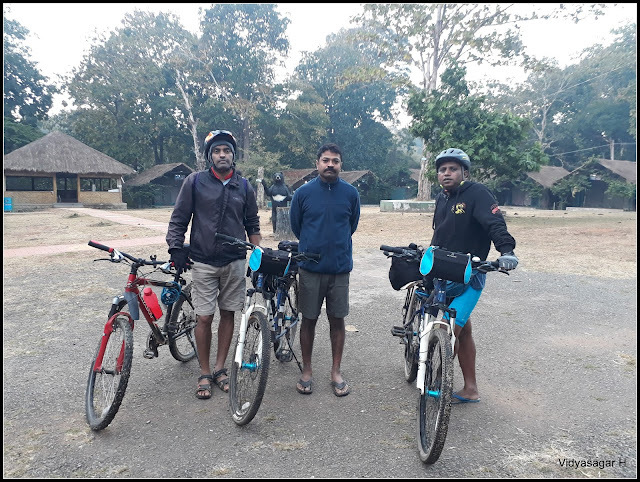 A close three friends, cycling three days, wonderful camping at nature camps, peddling through reserved forest, ending at beautiful beach!!! 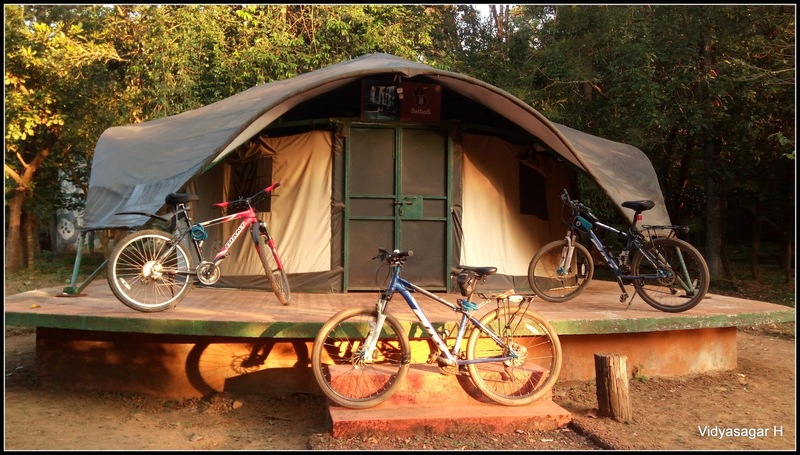 Yes, these all happened Dharawada to Karwara three days cycling on 10 – 12th December 2016. The team was myself, Shanthi Prasad & Sudhakar. I and Shanthi Prasad wanted to do this trail sometimes back, this ride decision taken within short time. There is an interesting story of joining Sudhakar with us. He never peddled the MTB and not in touch with any cycling activities. 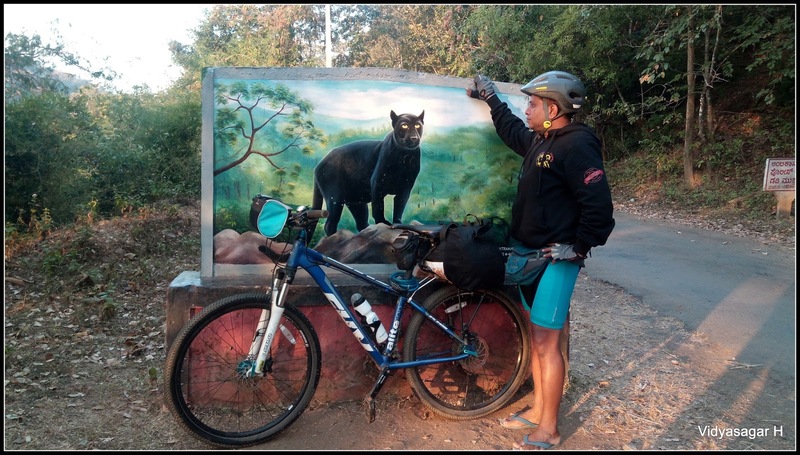 Sudhakar was not confident and never thought doing a maiden attempt of 200+ KMs. Myself just sparked the cycling in his mind and asked him to join with us. 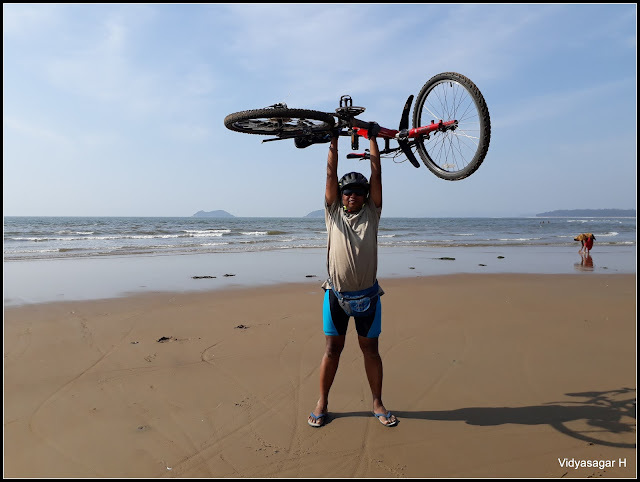 Shanthi Prasad also motivated him to join and both made him confident about finishing the ride. By great difficulty made his mind to join with us. Now the challenge is to arrange the cycle. 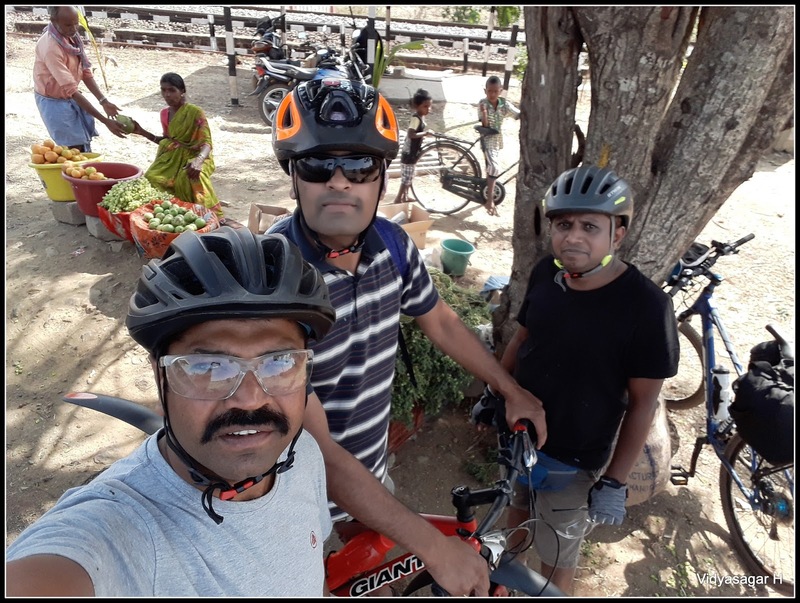 Thanks to Adarsh & Ananth who spared us bike and our issue resolved. Bike is ready and person too ready. 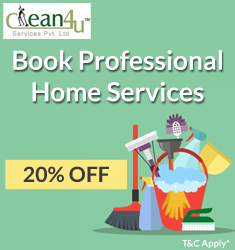 I have taken the responsibility to book the tickets, Shanthi Prasad arranged about our stay. First day camping at Kulgi Nature Camp and second day Anshi Nature camp. I had been these place with family twice. The firstvisit with my daughter and cousin family, second visit with my family. I just love to camp the both place again and again. We need to board the bus from Majestic, always I feel painful while riding home to bus stand and after completion of event back to home. 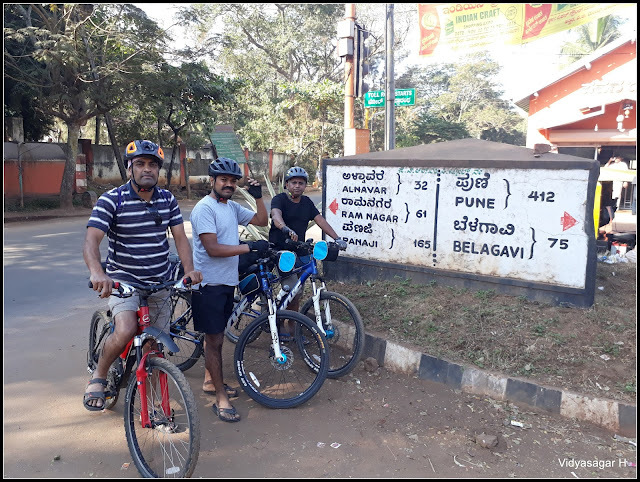 Bengaluru traffic irritate a lot for cyclist, I and Sudhakar started journey from Raja Rajeshwari Nagar. Floating with traffic reached Majestic by 9.30 pm. The bus was scheduled at 10.15pm, soon Shanthi Prasad also joined with us. 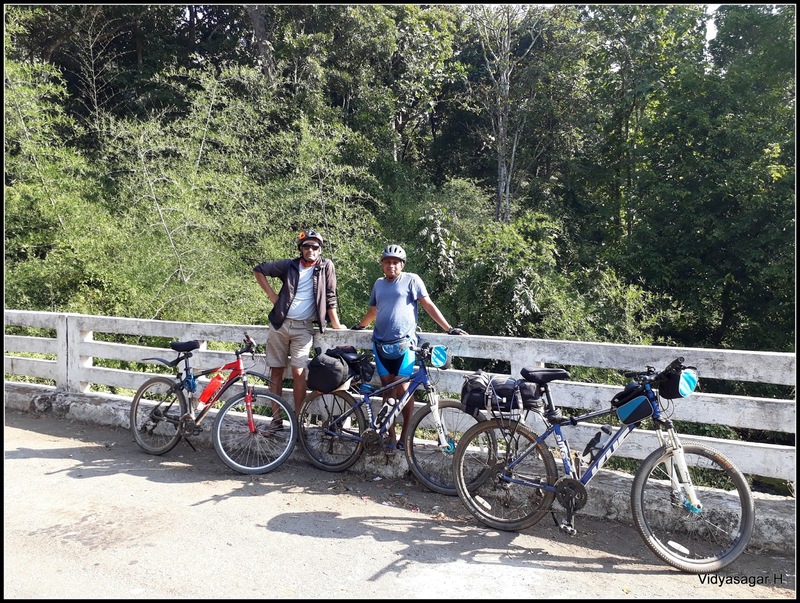 Driver & Conductor were more co-operative, boarded our bikes in the luggage compartments and continued our journey. When opened the eyes, the bus was still near Haveri. Pathetic driving, surprisingly the red KSRTC busses were over taking our bus. We were almost an hour late by schedule. Reached the Dharawada bus stand around 9 am. Finished our morning core job at bus stand. We finished the breakfast roadside a good hotel. Everyone set ready to begin our three days a long journey, took a group photograph. Initial trail we missed and hit to Alnavar road. After couple of KM ride understood, we took a long way trail. Not worried much, continued our journey. 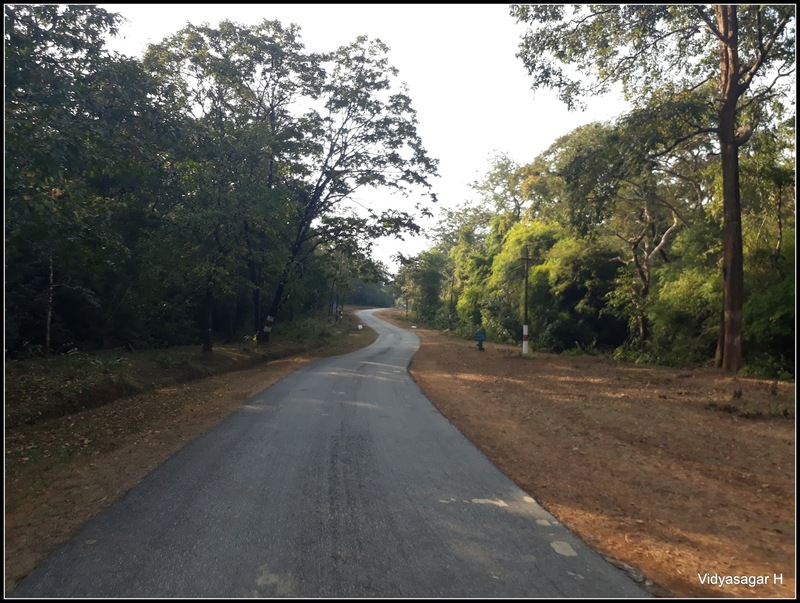 Instead of tar road, decided to take interior village route. 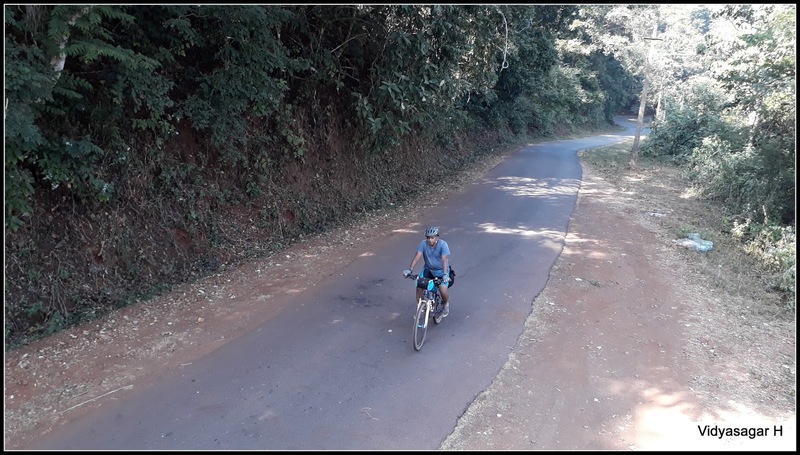 Passing through a small forest range reached Alnavar at 12.30 Noon. The trail was scenic, spent good time with photography. Decided to finish the lunch at Alnavar, found a good Khanavali on the road side. The tasty lunch filled our empty stomach and continued our journey. The sun was on top, decided to relax for some time. 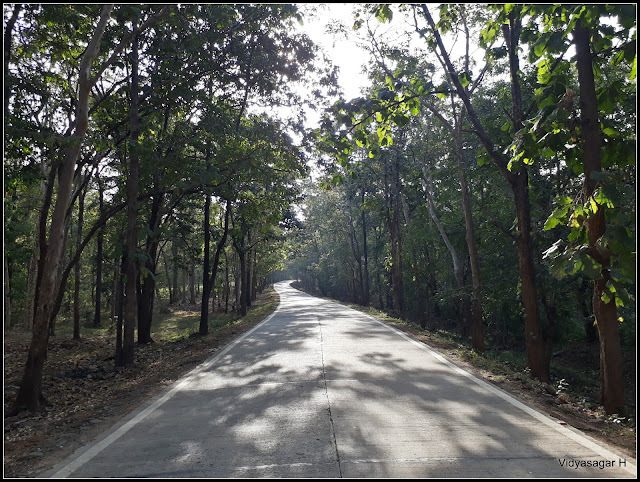 Found a tree shade roadside, spent half an hour relax. 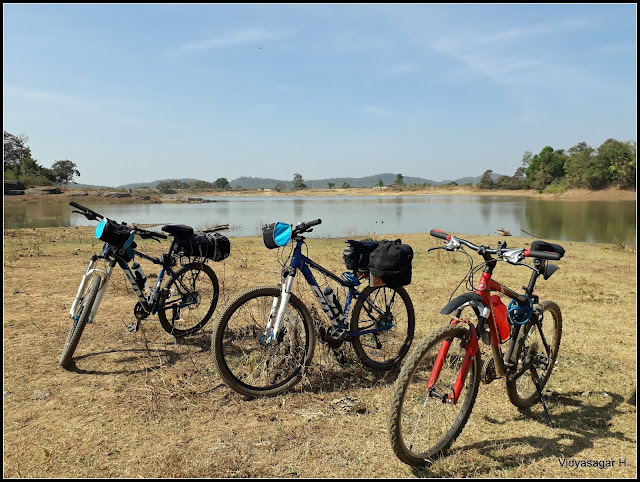 When we reached Haliyal it was 3pm, the trail was flat and very soon reached Dandeli. 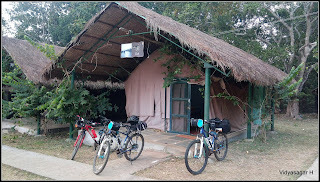 Took multiple breaks in between and finally reached Kulgi Nature Camp by evening 6 pm. Finished the check in formalities and allotted a Deluxe Tent. Relaxed our bikes and got refreshed. The day went well and enjoyed the ride. Relax evening roamed around the camp, finished the dinner and retired for the day. We woke early morning at 5.30 am. Finished the morning job and left the early to cover maximum distance before the noon. The day was good by scenic and bad by food. 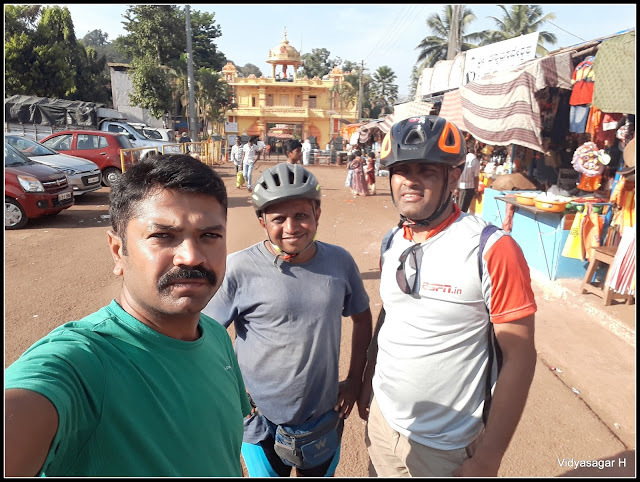 By suggestion of the guard at Kulgi nature about getting a breakfast after some 10 – 12 KMs ride. The interior forest route was very calm and empty narrow road. Enjoying the trail reached the junction point. We found a small hotel where you can have only tea + biscuit. After enquiring the hotel, the only stop for food is Ulavi. The distance was around 40+ KMs. Not to take risk, filled our stomach with tea and biscuit. From this point, the trail is awesome. Vehicles are not allowed between 6 pm to 6 am. Thick forest and lonely curve road give you more joy. The vehicle moment is very less, we enjoyed the ride. Many breaks for photography, reached the Syntheri rock junction. 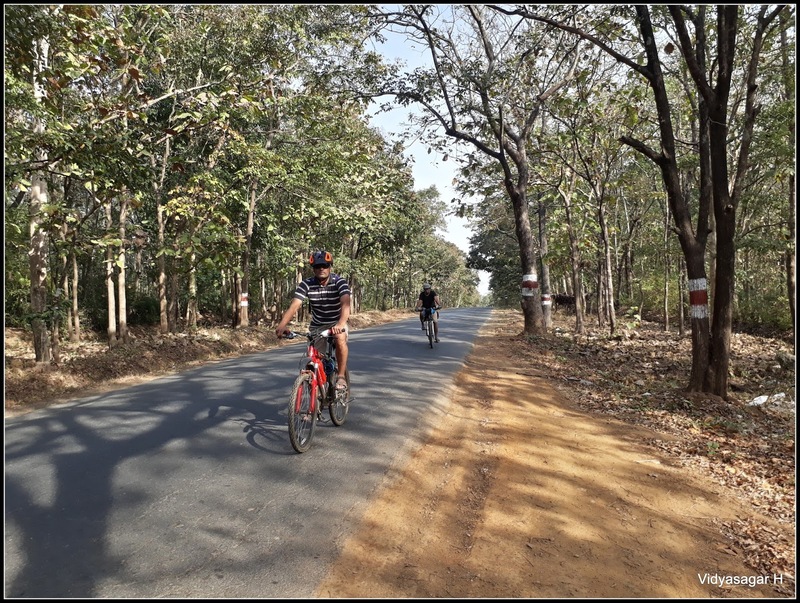 From main road, again we have to peddle around 2+ KMs inside the forest. Off road experience for this trail, reached the Syntheri Rock. The place was already filled with tourist, spent some good time and headed towards Ulavi. We badly suffering by hungry, the only hope was Ulavi. The trail was rolling one, make you tiered. Reached the holy place Ulavi by 2pm. Parked our bikes nearby shop and headed to Dasoha [Temple Kitchen]. We were lucky, after our entry the kitchen was closed. Just five minutes late could have again issue for us. A big thanks to God for arranging the lunch. Spent a good time in temple premises, paid darshan to Ulavi Sri Chenna Basaveshwara. The temple was not much crowded. 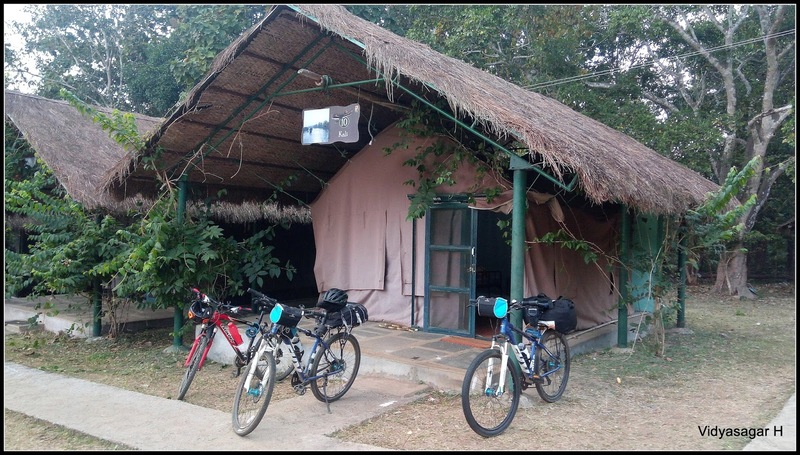 Now our next destination was Anshi Nature Camp. 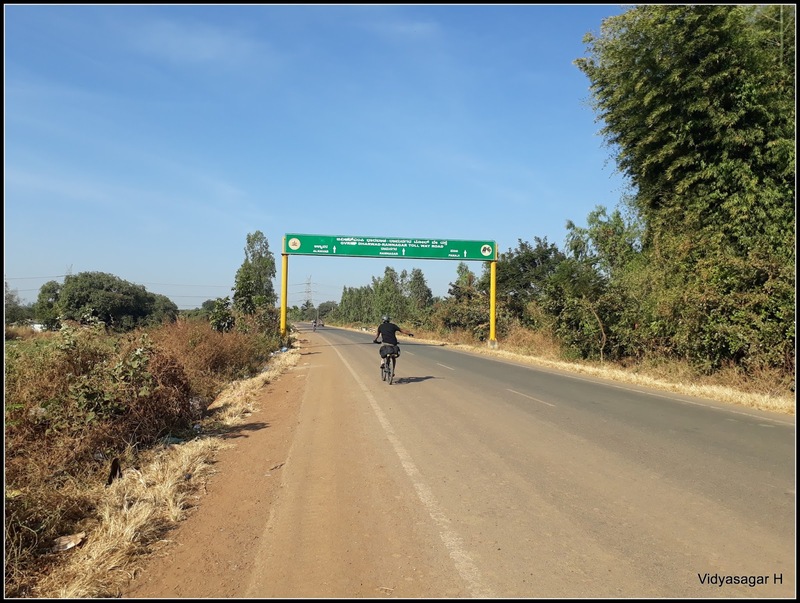 The distance was around 20KMs from Ulavi. We decided to peddle fast and reach the camp before sunset. The dense lonely forest make you scary after sun set. 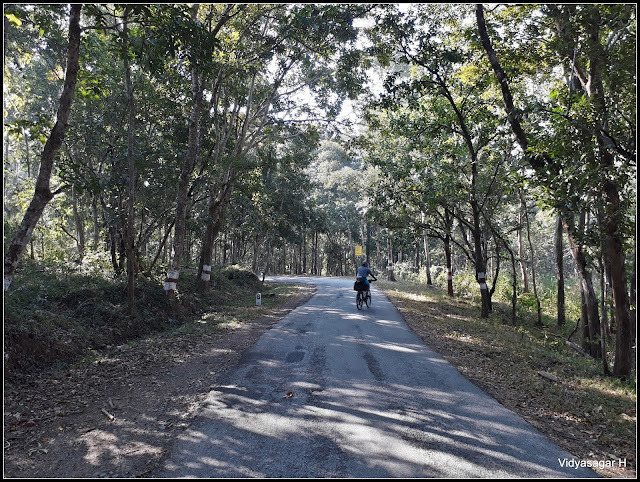 Enjoyed the silent valley and reached the Anshi by 6pm. Finished our check in formalities and allotted the tent. After ride, the hot water bath will make more refreshment. We all got refreshed and explored the camping area. The dinner call got around 8 pm and retired for the day. Second day was again rolling one, enjoyed the beautiful trail with empty stomach. The final day was not much distance and tough one, decided to start the journey late. Morning breakfast was yummy Poori and bid adieu to Anshi beautiful nature camp. 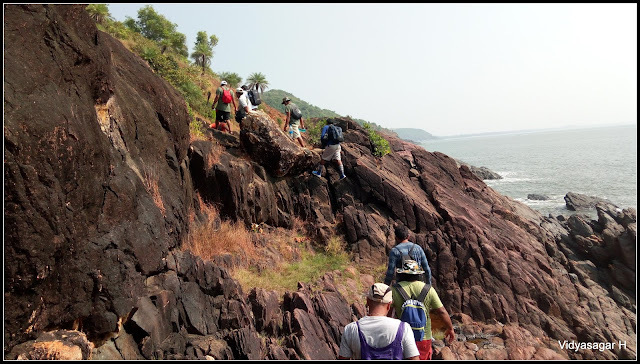 The descending trail very soon took us to Kadra junction point. Taking multiple breaks very relax reached the Karawara town by 1 pm. Finished the lunch in one of the Udupi hotel and headed towards the beach. Our bus scheduled by 5pm, we have enough of time to spend on the beach. Lot of photography & shooting ended our journey. The beach was more crowded since the Karawara Utsava on the beach. We reached the bus stand by 4.30 pm and the sad part was waiting and waiting. Due to traffic and other stuff, bus reached the bus stand 7 pm. This waiting was most crucial time for all of us. Boarded our bikes in luggage compartment and relaxed in the bus. Journey went well and reached Bengaluru by 7 am. Kudos to Sudhakar for successful completion of maiden cycling journey 200+ KMs and special thanks to Shanthi Prasad joining with me.